When my boys were in preschool they went to a Waldorf school. Every year towards the end of January, we’d get a list of names for Valentine’s Day cards. The first time I encountered this, I noticed that the class list included all of the children in the class. I really appreciated that the school wanted every child to enjoy the thrill of receiving cards. When I was in elementary school this was not the case. I remember actually feeling anxious and worried about not receiving any Valentine’s Day cards from my classmates. Fortunately, this never happened. At the Waldorf school they were very clear about the type of Valentine’s Day cards that were allowed. No Disney characters, brands, TV references and homemade cards were strongly encouraged. My birthday falls the day before Valentine’s Day so I’ve always had a sweet spot for what some people equate to the first “Hallmark” holiday. While making homemade Valentine’s Day cards sounded like fun to me, making close to sixty seemed overwhelming and time consuming too. Over the years, I figured out some great Valentine’s Day card ideas that are easy for kids to make and won’t be too complicated for class lists of thirty. Allow yourselves plenty of time to make your cards. We always made our cards over the course of a week. 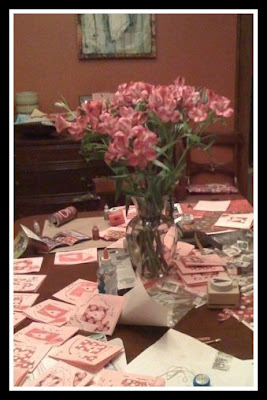 During our Valentine’s Day week, our dining room table became the hub of all things Valentine’s Day. Be sure to pick an area where you won’t mind a little extra glitter or mess. Take a trip to a party / paper store. Paper stores offer more choices and you can buy smaller quantities of unique patterns or designs. Let the kids help choose the colors and schemes. Paper stores also stock other things that are useful for making your own cards like stamps, ribbons, glitter, stickers, heart die-cutters and more. Stock up! Use what you have. Don’t be afraid to include materials from around the house like fabric, dried flowers and colorful buttons. Kids love having lots of things to choose from. When my boys were very little, we would come up with a card design that let them practice some of their small motor skills. One year, they used yarn and a needle to sew around the hearts. Another year, they practiced their scissor skills by cutting out thirty hearts each. For a really easy Valentine Card idea, take a piece of card-stock and use a heart die cutter to cut a heart and use a current photo as the centerpiece and decorate around it. Another cute idea is to make a heart out of thicker foam poster board and cover it with chalkboard paint. Use the heart as a prop in a photo. That way, you can create several different Valentines with unique messages. My boys love using stamp pads so one year we picked up some extra vegetables and bought colorful inks like pinks, red, purple and white. Cut the vegetable in half and use it to make a unique print. Brussel sprouts, radicchio, onions and romaine leaves work great! If you’d like to create a Valentine’s Day card that looks good and is functional, how about a Valentine’s Day card bookmark? Start with rectangular shaped card stock. Get out the glue sticks and let your kids use glitter, ribbons, stamps and stickers to decorate. 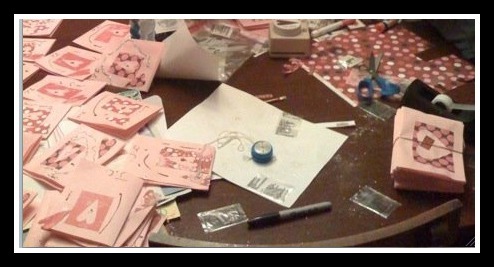 Whether your Valentine’s Day card project is simple or complex, enjoy the process. Don’t worry about making the cards look perfect, the imperfections are part of the charm. Be sure and keep a card for yourself. I keep mine with our supplies so each year we can see all of the cards from previous years. What a treat! Lisa H. writes for a variety of blogs and websites including Flash Digital Portraits. When she's not writing, she enjoys spending time with her family, playing music, cooking and walking her dog.